I’m not sure why, but the longer I live, the more I love fall! 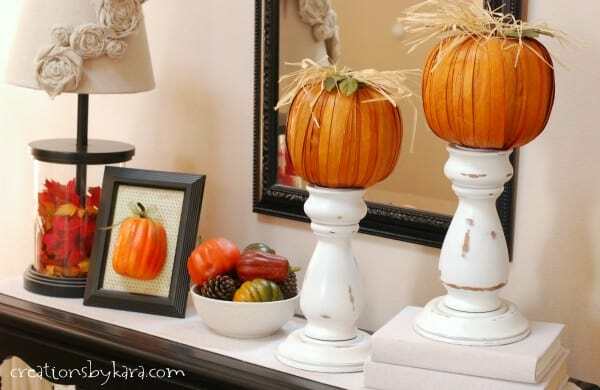 Fall decor just makes me happy! I haven’t tackled my mantel yet, but I did manage to get my entry table all decked out for fall. Everyone who comes to the door sees it, so I thought it was a good start. 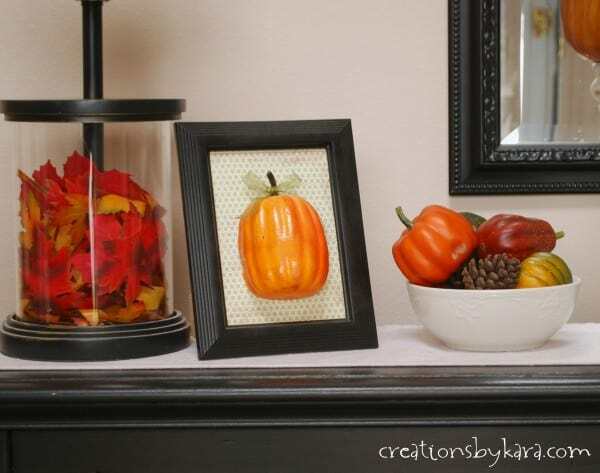 Here are a few fall decorating ideas to get your fall juices flowing! I still adore my apothecary lamp that I bought several years ago. I simply filled it with fall leaves. The pumpkins were purchased at Walmart several years ago. I placed them on top of chunky candlesticks and used some fabric wrapped books for height. I am still looking for a vintage bowl, but in the meantime I just grabbed a bowl from my kitchen and filled it with pine cones and plastic fall picks. Sitting next to the lamp is my dollar store framed pumpkin. 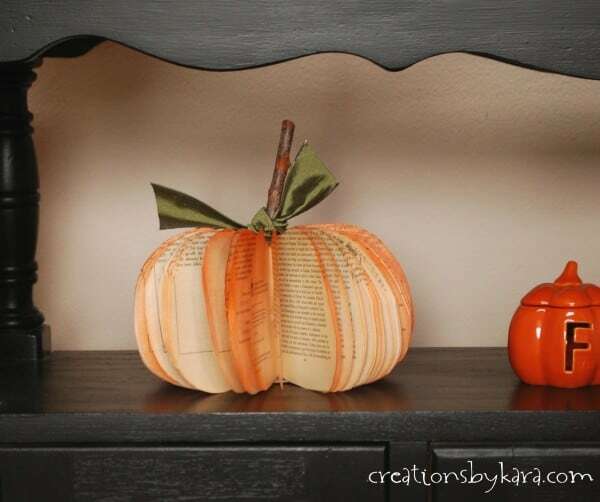 Of course we can’t forget my most popular fall craft to date, the Book Page Pumpkin. Still love it! 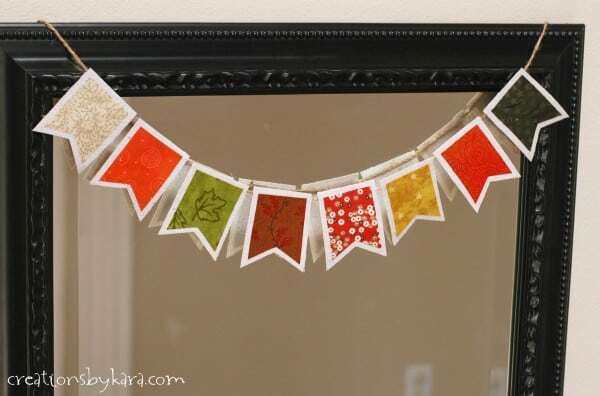 I will be sharing a tutorial for this easy fall banner as soon as my husband has time to fix my scanner so I can share the pattern. Stay tuned! 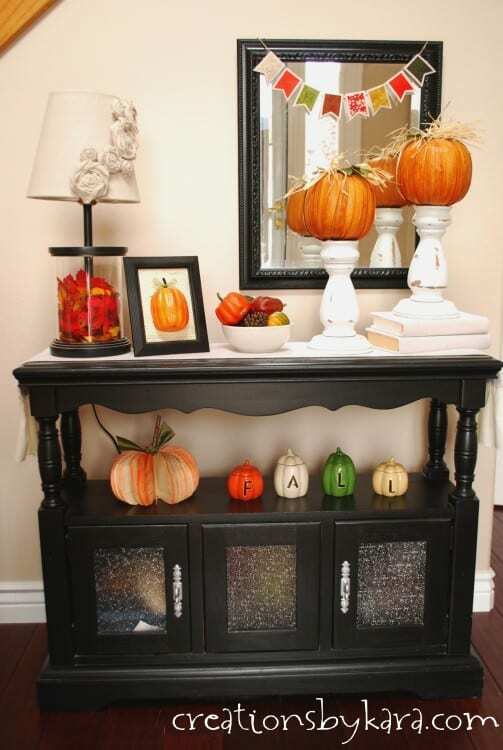 I love walking through the entry table and seeing all the fun fall touches. Fall is just awesome, isn’t it? That lamp is amazing!! Where did you find it? 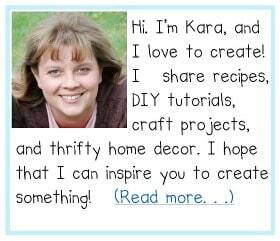 Kara, the entryway table is absolutely adorable! Loving all the Fall stuff! You are so talented! Can’t wait to see the mantel! Aw, thanks so much! Can’t wait to see all you cute sisters at BYB! I love it! Fall is my favorite time of the year too. Thanks Melanie! I hope that someday in my life I can actually experience fall in your neck of the woods. It’s gotta be amazing! I love it…I love fall, the colors, the smells, the crisp feel in the air. My fav time of the year. Thanks for sharing, you did a great job and it looks really nice.